Simplicity, Beauty, Flexibility, Function, Quality, Performance. These words elicit thoughts of an elite group of products, products that not just perform a function but do so with elegance, style and ease. They give you the freedom to accomplish your goals without the barrier of their design. Today, Cagic strives to be a part of that group. Cagic is a digital picture frame created to fundamentally change the way consumers display their pictures. With a passionate attention to detail, the Cagic team carefully thought through every aspect of the outward appearance and internal function of the frame. The physical frame was designed by a European trained interior stylist using quality materials and a passionate attention to detail. The operation of the frame is designed to be intuitive and natural. Cagic was the product of our desire to provide something better. We hope you will love it as much as we do. European Styling – Cagic will look beautiful anywhere in you home. The frame was designed by a European-trained interior stylist using quality materials and bringing a passionate attention to detail. Unlike other gadgets on the market, Cagic will look gorgeous in any décor and from any angle. Your frame is not a gadget but an element of home décor. Intuitive Touch Matting Interface – You are interested in a digital picture frame because you want to enjoy your pictures not because you want to learn how to operate a new gadget. We at Cagic understand this which is why we created an intuitive touch matting interface for effortless frame operation. 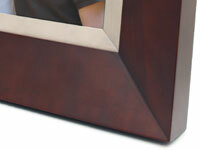 Just touch the metal matting on the frame to control the picture show. Freedom in orientation – How will you place your frame? Cagic can be placed vertically or horizontally according your preference or mood. 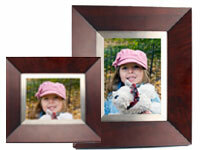 Your frame will immediately and automatically display pictures correctly for however the frame is placed. Expandable memory – We won’t box you in. 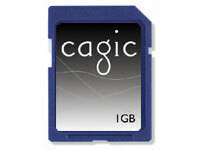 Like most other frames, Cagic has multiple slots to accommodate whichever camera memory card you have. In addition, Cagic has an extra SD memory slot that ships with a 1GB SD card inserted. This gives you the convenience of on board memory with the flexibility to expand the memory available based on you needs. Take a lot of pictures? You can simply remove the included SD card, replace it with a larger one and you are ready to display thousands more memories.